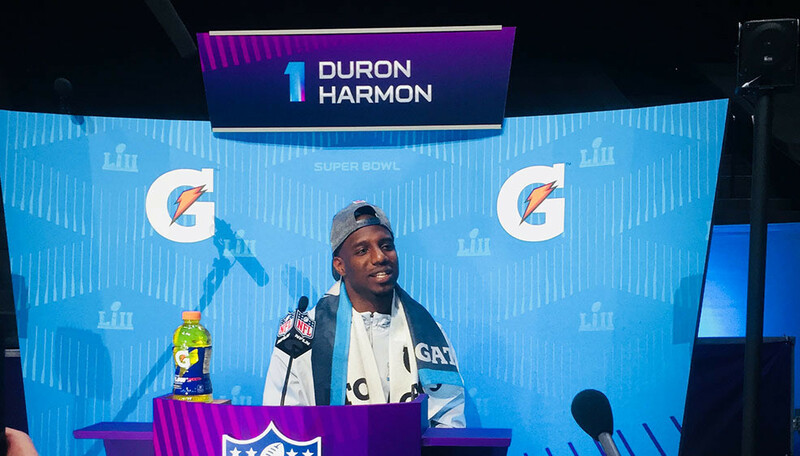 Super Bowl Opening Night Fueled by Gatorade kicked off an exciting week in Minnesota by giving the media their first chance to sit down and talk with the teams before the game. 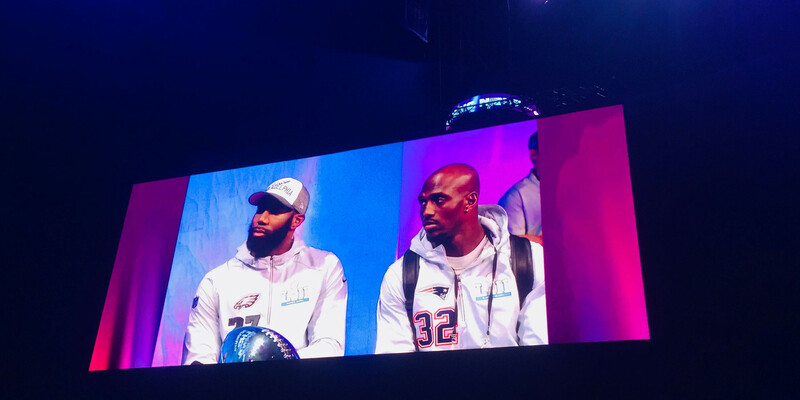 The show provided one hour of media access to each team, with multiple interviews taking place simultaneously. The on-site fan experience was sold out, and interviews were nationally televised by the Host Broadcasters to at-home audiences eager to catch every moment. 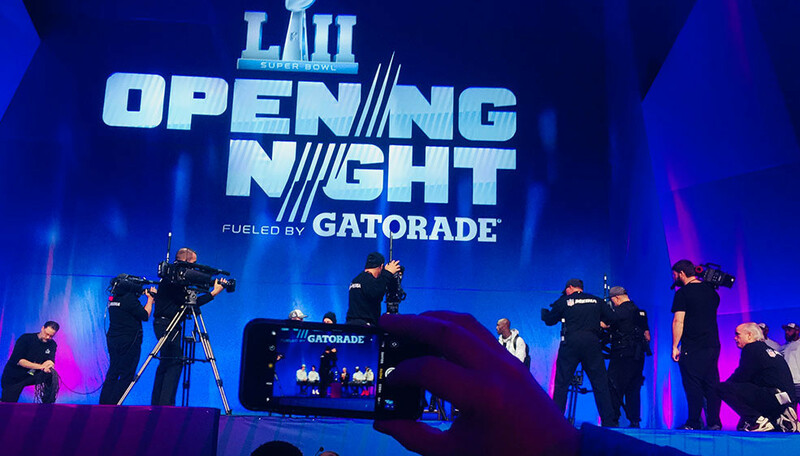 This event needed to meet the needs of multiple constituents, including the live attendees, TV broadcast viewers, production crews of the two host networks, and of course the players, coaches, and other NFL personnel. To make matters even more complicated, the event was to take place in a hockey arena that also had an active game schedule. The entire production had to be moved in and out in between Minnesota Wild games. 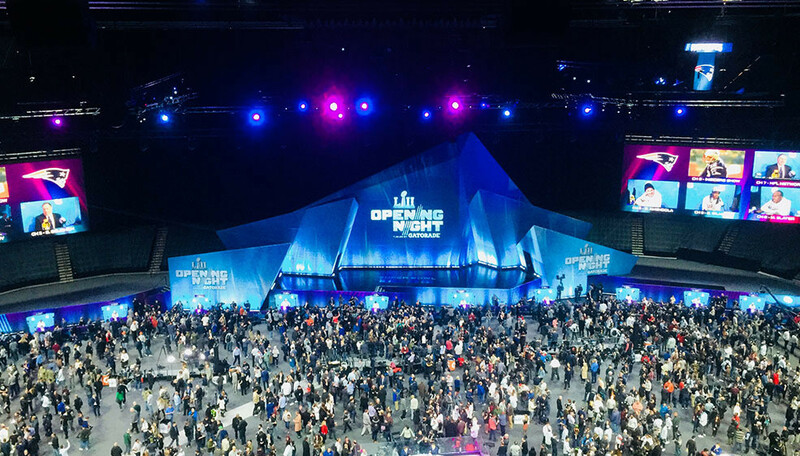 It fell on Freeman, in conjunction with other NFL vendors, to transform the arena into a press theater that created a cohesive flow for everyone involved. Because the fan experience was paramount, Freeman creatively used video to let the on-site audience in on the action. To start, each fan received a commemorative opening night bag that included a special radio receiver, provided by a third party. During the multiple simultaneous live interviews, Freeman streamed a video feed of each interview to a large split screen with multiple concurrent interview sessions, each identified by a number. Fans could use the receiver to tune into the sound interview they wanted to watch, creating their own completely customized experience. Both Host Broadcasters were able to conduct and broadcast their interviews with ease and full technical support, and the thousands of fans in the arena were delighted to have the choice of watching the interviews that mattered most to them. By combining a live event with the power to “change the channel,” Freeman gave the fans the best of all worlds.